Indexing "The Girl's Own Paper"
y mother, Honor Ward, was born in 1925 and may well have come across The Girl's Own Paper during the 1930s. By the early 1950s my parents were living in the Gold Coast, now Ghana, the beginning of a working life spent in Ghana, Zambia, and Swaziland. Over the course of thirty years, during their periods of leave in the UK, my mother would pick up odd The Girl's Own Papers from second-hand bookshops and market stalls. As the collection grew, she added their many treasures to her already vast range of reading. The period she decided to concentrate on, 1880 to 1941, contain an extraordinary social and cultural history of British life from the time of the First Boer War to the Second World War. The smallest domestic details and the largest of societal changes are accurately and sensitively made visible in the large and beautifully printed pages, and it easy to understand the fascination. By the time she retired to the UK in 1986, my mother had assembled one of the few complete collections of the The Girl's Own Paper for the period 1880-1941. While she derived great pleasure from reading them, the practical difficulties became considerable. 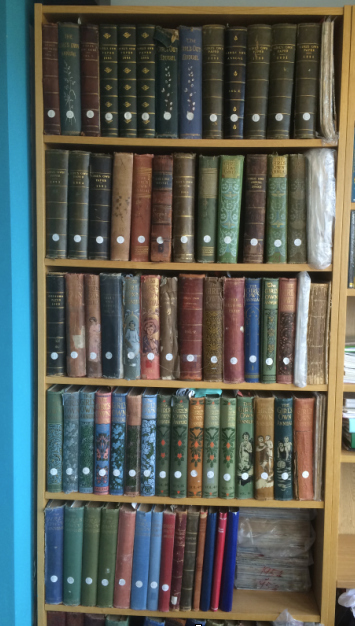 Following an author – and there are good reasons to be interested in some early stories by writers as beloved and familiar as Noel Streatfield, Angela Brazil and Baroness Orczy – through approximately 50,000 pages with very limited indexing in the back of single volumes is a formidable task. It is formidable physically – the volumes are large and heavy, and the 60 annuals require about three metres of shelf space – but above all it is the lack of an index that emerged as a real barrier. With her scholar's instinct, she set out to compile an index. More precisely, a series of indexes: a Fiction index sorted by Author, a Fiction index sorted by Title, a Non-fiction index sorted by Author, and finally a Non-fiction index sorted by Subject. I helped out with some options for assembling the index, initially on 'Hypercard' stacks running on a small computer. The Fiction indexes were published in 1992 by A. & B. Whitworth, 17 Hill St. Colne, Lancashire, England, under the title 'GIRL'S OWN GUIDE' by E. Honor Ward. As the project grew it became clear that its natural home was as a series of linked web pages, and I moved the contents via a rather laborious and largely manual process onto the web. Some years later, my mother's deteriorating health led to the physical collection moving in with me, renewing my own interest in these remarkable volumes. The online index – currently hosted by my accomodating employer, Durham University – seems to be of use to anyone interested in making systematic use of the GOP, and I hope will prove to be of interest to users of the Victorian Web.